Jefferson Westshore offers luxury one bedroom, two bedroom, two bedroom + den, and three bedroom apartments in South Tampa, FL. Our community has everything you need to live a resort-inspired lifestyle. With eight floor plans to choose from, you’re sure to find a home that matches your needs. 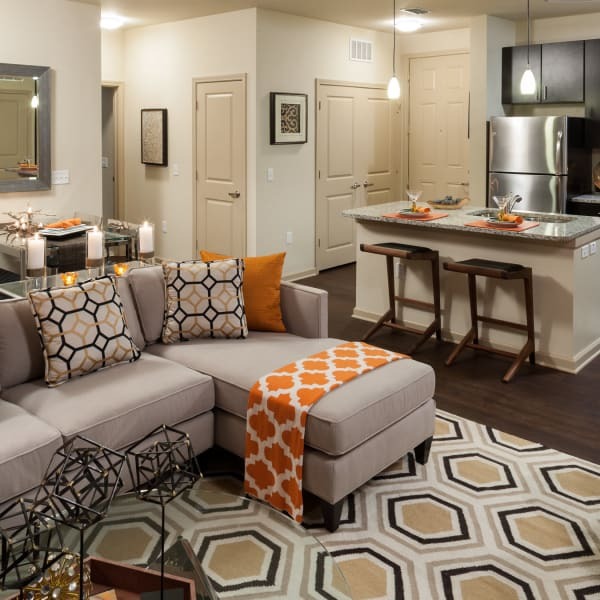 Enjoy open floor plans with spacious layouts with up to 1,400 square feet of room to spread out and live comfortably. Each of our apartment homes are equipped with everything you need for luxury living. The kitchen showcases sleek granite countertops, stainless steel appliances, and custom cabinetry. Select a layout to suit your lifestyle with island or breakfast bar options. You’ll be pleasantly surprised by essential features such as walk-in closets and ceiling fans in your home. The Florida lifestyle means outdoor living and our patios and balconies make for the perfect spot to entertain guests and take in scenic courtyard views. Do you have a favorite floor plan? Come see it yourself. Get in touch with our team and schedule a personal tour today.